Hey, hey, Kay and James!! Yvang: Boy! What you're missing! @ Kay: Veeblefetzer -- I remember that one! Greets, Tony, assembled Coultergeists, those which require some assembly, and Drummer Stream newbies. This is quite an awesome show so far. Really enjoyed that Sternpost song, and this current weirdness. Tony and Kay: For years I've had North American Veeblefetzer in my short list of potential-future-band names. what is that instrument being plucked? You particularly need to put on your 3-D glasses for this Maciunas Ensemble track. With them on, you'll hear that this is actually a cover of "New York, New York." Glad to hear it, Quinn! That would make for a nice black-light wall hanging in my custom van. Weird that that John Carter album has Charles Dodge on it. @ Rich: Yeah, I was going to mention that -- tho I think he just contributed his voice-processing program. Lasagna is on the horizon. I already have the shiitake, tomatoes, and ricotta. Still need fresh noodles, 3 pounds of fresh spinach, zucchini, etc. Oh boy! I so dearly want to cook for this T-giving, I just don't have the time. Much later date on this one than I'd have guessed. Don't give an S, give a T.
@ Listener James: Yes, they obviously didn't notice it was the '80s. One of the nice things about cooking is all that cooking wine. One bottle per cook per kitchen-hour seems to work out well. I haven't made lasagna in years (ok, only once, and it was veggie). I need a potluck to get rid of that much food. One good thing about wine is all of the wine. Veggie is de rigueur in our household. Makes for a very bright flavor and highlights the scandalous entaglement of Rosemary and Basil. I tried to google them once or twice. Can you imagine how far I got? A band whose Raison d'être was a drum machine. Heh. I remember practically nothing of them beyond that anecdote, but it stuck for some reason. And because Ann Arbor is the center of the world, I guess. Early 80s. The Cult Heroes were based across the street. Insanity, new to me (well, the band, not my current state of mind). @ βrian: That's a bit of the back cover of the album I played. @ Michael 98145: Ha!! Zippy! Sorry NGH! Wish I could send you a baby one! @ NGH: I've got an Insanity LP coming in the mail. Listen for it on a future show (probably in two weeks). For some reason, we've not been successful in growing basil but we have a couple of little rosemary bushes right outside our back door. Only my chili pepper plants (poblano, ghost, and carolina reaper), tomatoes, and eggplant are still thriving. They survived last weekend's frost.... (I have more chilies and tomatoes then I know what to do w/). Butternut squash will probably die in a week. Carolina Reaper sounds a little ominous. I'll stick with my more obliging serranos and bird's-eye chilis. Hi Tony. Lay it on me, man. Hello, Stanley. Missed you this AM. @Michael 98145: Yeah, he's kind of a wuss, that way. Rosemary is a lot more robust. We got down to 37F/3C two nights this weekend. It's warm again, now. Hi Sem. I was working at the office, so the 'interaction' was minimal. Did I mention we're going to Barcelona for the New Year? @ngh, can you dry the peppers and make powders? Hi I've been listening but also distracted. It's fun having a freeform show again! Stanley, you did not. I had 4 days there some years back, marvelous town, and the cooking is sublime, at least at those places I found two streets off Las Ramblas. Webhamster! Hiya! Yes, I missed freeforming -- gives me an excuse to have ridiculous segues. I can, I just don't have anything to dry them w/. It's still to humid to hang them out to dry. I need a smoker. the humidity may have had something to do with the rosemary failure ..
Sem, some years back it wasn't over run with tourists, like it is now. However it won't be too bad in the Winter. It'll be my first visit. Will have to be organised to know where the NYE action is and what's open the next day. But hey! We've had the most rain to date for a calendar year so far. (Above 80 inches so far), usually average 50ish. OK, off to lunch, thanks Tony! Progressive disco is the quadrature of the circle. Heading your way tomorrow a.m., Tony. Three and a half glorious days in sunny PDX! In WI, the excessive rain seemed to to decimate our rosemary, too. @ Dean: I'll be heading in the opposite direction (not strictly, I guess, since I imagine you're coming from California). Yes, from Northern CA. You heading east? This episode doubleplus good, Tony. Now where is the Victory gin? See you and all next time. Hello Tony! Nice fork music! Thanks, Tony. 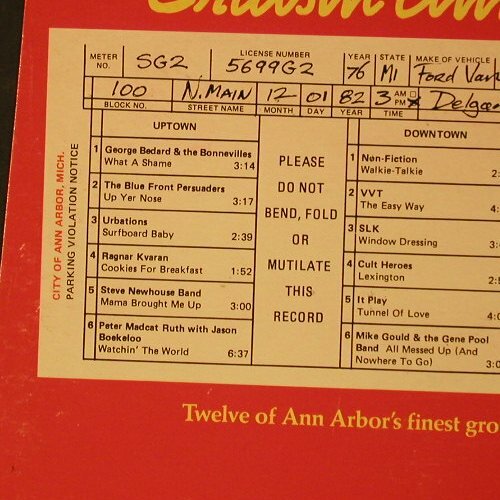 Especially for the Ann Arbor flashback. Thanks TC. Hope you have a delightful Turkey Day.